NOTE: Case Cover FOR SAMSUNG GALAXY S3 SIII i9300 ONLY. Battery Not included! 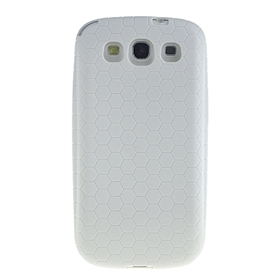 New high quality Flexishield TPU Gel Case for SAMSUNG GALAXY S3 SIII i9300. Offer instant all around protection from scratches. TPU, also known as thermoplastic polyurethane, is more cut and tear resistance over rubber. This gel case made from a special tough gel, which makes it flexible like a silicone but tougher than a crystal case. Compared to silicone skins, this skin is stiffer to the touch, but remains flexible.